Are you looking for a home on the lake? If so, we can’t recommend Cornelius, North Carolina highly enough. In this wonderful community you’ll find some lovely homes and pristine neighborhoods that offer close proximity to Lake Norman—making it easy for you to maintain the lakeside lifestyle you’ve always wanted. In particular, allow us to highlight Robbins Park—one of the best developments in Cornelius, and potentially a place for you and your family to call home! We’ll share with you a few quick highlights about Robbins Park, then some facts and figures about Cornelius as a whole. Many locals simply refer to Robbins Park as “The Park,” and it’s not hard to understand why. It’s built around a beautifully preserved wooded area, where outdoor space and nature trails abound. This is the place for those who have always wanted to live amidst some greenery—to be close to nature while also experiencing all the convenience of the city. Of course, what this means is that Robbins Park offers plenty of opportunities for outdoor recreation, including playgrounds, tennis courts, and even a disc golf course! Water activities are also available. There’s a community pool here, but the real draw is Lake Norman itself, located close by. In fact, when you live in Robbins Park, the Lake Norman marina and boat club are literally right across the street! 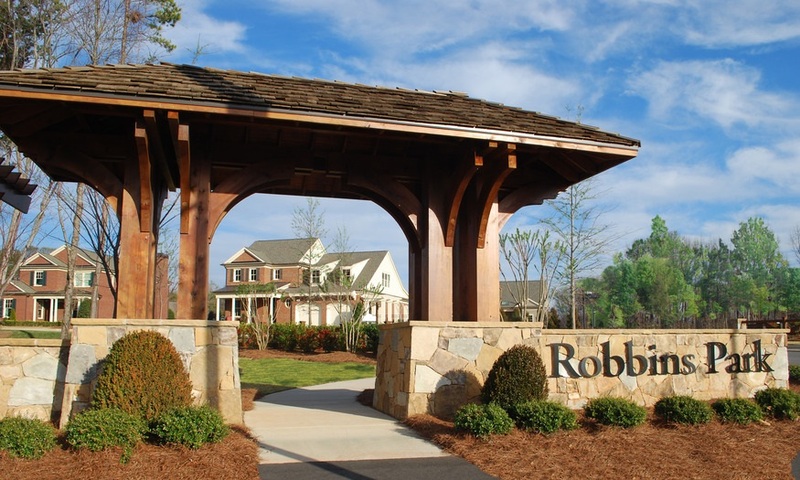 Robbins Park’s location offers a number of other conveniences, too—including close proximity to the beloved Birkdale Village shopping area, where you can shop, get meals, and even go to the movies! Of course, the City of Charlotte is not too far away, either, so big city amenities are always accessible. As for Cornelius itself, this is a great town that is always welcoming to newcomers! Clearly, its lakeside location is a big draw, but so are the great schools, the may excellent homes, the small-town feel, and the easy access to Charlotte. Are you looking for a new home in the Cornelius community? We think you’ll love it—and we hope that you’ll love Robbins Park, in particular. Our North Carolina real estate experts would love to show you some of the many wonderful homes in the area. Contact us today to set an appointment!